(Newser) – A group of nearly three dozen migrants, most of them kids, paid smugglers to whisk them out of Niger and Nigeria and to a new life to the north—but instead paid the ultimate price. 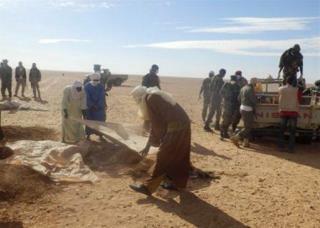 The five men, nine women, and 20 minors were found dead Sunday in the Sahara, per Niger's Ministry of Interior, apparently ditched by those they'd hoped would save them and likely victims of extreme thirst, ABC News reports. The interior minister said the migrants had perished between June 6 and June 12 near Assamaka, per the BBC, with the Guardian noting that temps in the desert can soar upward of 105 degrees Fahrenheit. What transpired isn't an uncommon consequence: "Thousands of people have lost their lives as a result of the indifferent or even deliberate actions of migrant smugglers," the UN Office on Drugs and Crime says on its website, noting that as borders have become more tightly policed, migrants have become more wary of trying to cross over on their own. Arabs send their children cause they know they will be taken in as refugees then under the pretend of family reunification all 20 family members of each child are brought. All these human smugglers should be summarily executed on sight..
b..b..but in the US Christian bakers refuse to make a gay wedding cake! ARRRRGGGG!!! SPITTLE SPASM!!FUME!!!!! !